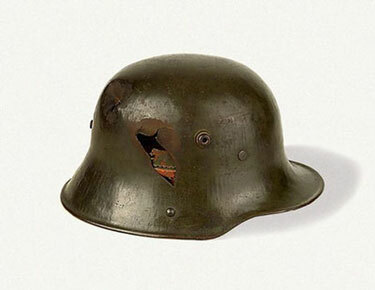 German steel helmet Mod. 1916 from the collection of Ernst Jünger. Steel, leather | L 31 cm, W 24 cm, H 17.5 cm, G 1250 g | Wilflingen, Ernst Jünger Foundation. “The steel helmet gives the soldier a desolate look,” noted front-line officer Ernst Jünger (1895-1998) in August 1916 as his unit, the 73rd Infantry Regiment became equipped with the new head protection of the Prussian troops. The engineer Friedrich Schwerd (1872-1953) had designed the helmet with an extended eyeshield and a deep neck guard in 1915 according to military medical specifications, after it had been shown that the spiked leather cap could not provide the soldiers in the trench fighting of the Western Front with sufficient protection. 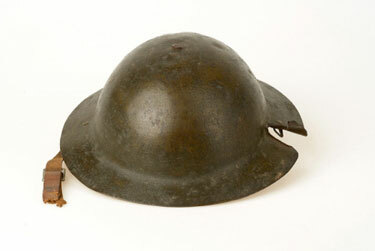 The new helmet was delivered to the troops beginning in the spring of 1916. In the course of the war, 7.5 million of them were produced. In an infantry assault during the offensive in Flanders, December 1, 1917, Jünger was struck by shrapnel on the head. Although the projectile broke through the helmet, Jünger suffered only minor injuries. The helmet thus became the writer’s most important war trophy and was always kept within reach for life, along with a second steel helmet that Jünger had taken from a fallen English officer in the summer of 1917. One Feedback on "From Ernst Junger’s Personal Collection"
I have a WWII Nazi helmet my Uncle John (RIP) brought home.